[189 Pages Report] The yeast market was valued at USD 3.23 Billion in 2016 and is projected to reach USD 5.40 Billion by 2022, at a CAGR of 9.0% from 2017 to 2022. The yeast market has been segmented on the basis of type, form, application, and region, whereas, the specialty yeast market has been segmented on the basis of type and region. This report includes an estimation of the market size in terms of value (USD million). Both, top-down and bottom-up approaches have been used to estimate and validate the size of the yeast market and various other dependent submarkets in the overall market. Key players in the market have been identified through secondary research such as Hoovers, Forbes, and Bloomberg Businessweek, company websites, annual reports, and their market share in respective regions has been determined through primary and secondary research. All percentage shares, splits, and breakdowns have been determined using secondary sources and were verified through primary sources. The key players in the yeast market include Associated British Foods plc (U.K.), AngelYeast Co., Ltd (China), Lesaffre Group (France), Chr. Hansen Holding A/S (Denmark), and Koninklijke DSM N.V. (Netherlands). Other players include Lallemand Inc. (Canada), Alltech, Inc. (U.S.), Leiber GmbH (Germany), Oriental Yeast Co., Ltd.(Japan), and Synergy Flavors (U.K.). The maximum value addition of a product in the global yeast industry is observed in the stage of manufacturing. The key companies that offer yeast focus on strategies such as acquisitions, new product developments, and expansions. Companies formulate new sales strategies to establish their innovative products in the market. These companies highlight product specifications and certifications from food safety authorities while promoting their yeast products. Value addition in the distribution and sales stage varies with key players, addressable markets, manufacturing units, and end consumers. This research report categorizes the yeast market based on type, application, form, and region. The global yeast market has witnessed a steady growth over the last few years. The market size is projected to reach USD 5.40 Billion by 2022, at a CAGR of around 9.0% from 2017 to 2022. The growth of the bakery industry and increasing demand for convenience food are the major drivers that have contributed to the growth of the market. 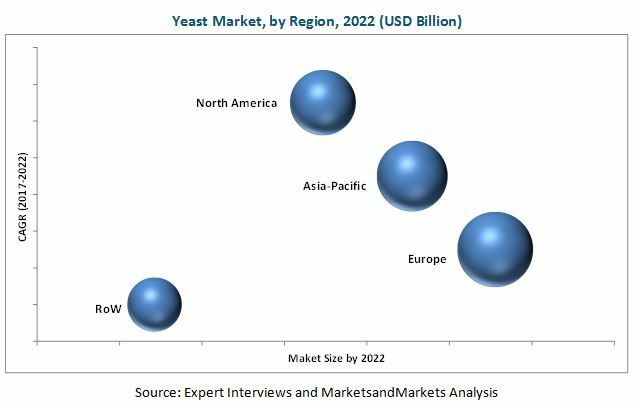 The yeast market, by type, is segmented into baker’s yeast, brewer’s yeast, wine yeast, bioethanol yeast, feed yeast, and others (nutritional and supplement yeast). The increasing trend of consumption of processed food items and bakery foods is leading to a high demand for baker’s yeast in developing economies. By application, the market has been segmented into food, feed, and others (including pharmaceutical and industrial). The yeast application in the food segment has been increasing due to the increasing use of yeast in snack seasonings, ready-to-eat meals, processed fish, meat and analogs, dairy, bakery, beverages, and dietary supplements. By form, the market has been segmented into fresh yeast, dry yeast, instant yeast, and others (including bread machine and rapid-rise yeast). The fresh yeast segment accounted for the largest market due to its wide use in bakery products such as bread, biscuits, and pastries. 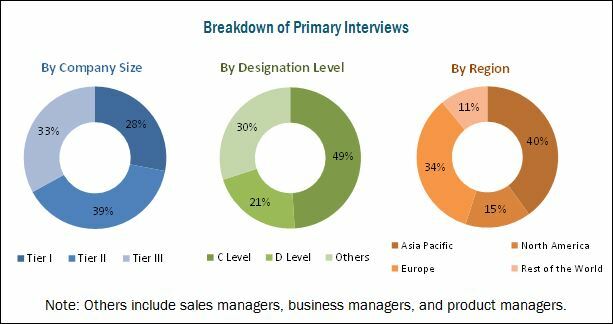 The specialty yeast market, by type, is segmented into yeast extracts, and yeast autolysates, other yeast derivatives, and others. Other yeast derivatives include yeast flavor enhancers, yeast saccharides, and yeast pigments, and others include nucleotides, minerals, and vitamins. The need for developing high performing yeast at the lowest prices for the highly competitive end-product market is the key driver of the specialty yeast market. The global yeast market was dominated by Europe in 2016. North America is projected to be the fastest-growing market from 2017 to 2022. The European yeast market is witnessing growth due to the increasing consumption of processed food products, increasing alcohol consumption, and increasing awareness about the nutritive value of yeast. Stringent food safety regulations is the major factor restraining the yeast market. Some of the regulations are Regulation (EC) No 834/2007, and in particular Article 20 thereof, which lays down basic requirements for the production of organic yeast. Detailed rules for the implementation of those requirements should be laid down in Commission Regulation (EC) No 889/2008 (2). Also, according to Annex VI (B) to Council Regulation (EEC) No 2092/91 (3), only enzymes normally used as processing aids were allowed to be used in organic processing and enzymes used as food additives would have to be in the list of authorized food additives of Annex VI (A) (A.1) to that Regulation. The global yeast market is characterized by moderate to low competition. Acquisitions and expansions & investments are the key strategies adopted by the key market players to ensure their growth in the market. The market is dominated by players such as Associated British Foods plc (U.K.), AngelYeast Co., Ltd (China), Lesaffre Group (France), Chr. Hansen Holding A/S (Denmark), and Koninklijke DSM N.V. (Netherlands). Other players include Lallemand Inc. (Canada), Alltech, Inc. (U.S.), Leiber GmbH (Germany), Oriental Yeast Co., Ltd.(Japan), and Synergy Flavors (U.K.). 14.2 Angel Yeast Co., Ltd.
*Details on Business Overview, Services Offered, Strength of Service Portfolio, Business Strategy Excellence, Recent Developments Might Not Be Captured in Case of Unlisted Companies.